Refrigerator repairs might include dealing with Freon and sealed system. 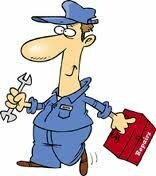 It is strongly recommended that you seek the assistance of a qualified appliance technician. If your refrigerator is not running or is not cold enough. 2. Clear/remove anything blocking the air flow around the outside of the refrigerator (on top, underneath, behind, beside, in front of, etc.). Allow 3" of clearance all the way around. 3. If there are condenser coils on the rear of the box, make sure the box is several inches from the wall and that nothing is on top at the rear, blocking the heat from coming off the coils. 4. If the condenser coils are underneath the refrigerator, clean the coils with a vacuum cleaner thoroughly at least twice a year. 5. Refrigerator coils located underneath the refrigerator should be cleaned annually. 6. Refrigerators that constantly run can indicate improper functioning due to low refrigerant level, a dirty condenser coil, a malfunctioning seal, or improper air flow. Ice or water dispensing problems. 1. If the ice or water isn’t dispensing check for a leaky water tube or jammed ice chute. 2. If ice maker is producing ice poorly check for clogged water line or defective water inlet valve. If the door is sticking or not closing properly. 1. Wipe off the face of the gasket with a wet rag and make sure the interior shelves, drawers and food are not preventing the door from closing from the inside. If it’s not working. 1. Check to see if power is getting to the range/oven. Does anything turn on, even a light? Check for blown fuse or tripped circuit breaker. 2. Is the power cord burned through; often it gets burned and breaks the connection. Electric - If your burners are not heating. 1. Make sure they are sitting straight in their proper positions. Electric - If your oven is not heating or not heating correctly. 1. Make sure the clock is set on manual cycle and not the automatic time bake cycle. 2. Is the bake element is burned out. 3. Check the heating thermostat bulb is dislodged from its holder. It could also be mis-calibrated. Gas - If the top burners are not lighting. 1. Wipe off the burner with a hot, damp rag and then dry completely. 2. If top burner doesn’t work check for a dirty or clogged burner. Make sure burner is clean. Gas - If your oven is not heating. 1. Make sure the clock is set on the manual and not the automatic cycle. 2. Raise up the top and keep the area clean and free of grease build-up. If the unit is not self-defrosting and the temperatures begin to rise. 1. Check the frost buildup on the inside of the freezer. If it is heavily frosted, manually defrost the freezer by turning it off at the thermostat. Unplug from the wall and allow 12 hours for the unit to defrost, with both doors open. If the unit is not an automatic self-defrosting model. 1. Defrost the unit once a year or as often as needed. Follow the proper defrosting methods. DO NOT USE a knife, pick, hammer, chisel, screwdriver, etc. or any sharp object. • Important Tip - Follow all procedures outlined under the refrigerator heading. If machine doesn’t work at all. 1. Make sure power is getting to washer. Check for tripped circuit breaker or a blown fuse. 2. Check wall socket for power. Sometimes the power cord disconnects at the washer. 3. Make sure the lid is closed properly. 4. Make sure the timer and all of the controls are set properly. 5. Make sure both water faucets are turned on. • Important Tip - Follow the proper loading procedure and machine operation. No power to the dryer. 1. Check for a tripped circuit breaker or blown fuse. Check wall socket for power with voltmeter. 2. Check for broken door switch. If the clothes are not getting dry. 1. Make sure the dryer is not pushed back against the rear exhaust duct causing an air flow restriction. 2. Make sure the clothes are coming out of the washer spun damp dry. If the washer is not spinning the clothes damp dry, the dryer will not dry the clothes in a normal amount of time. 3. Turning your clothes inside out and using the delicate cycle can reduce the pilling effect on certain fabrics. 4. Cleaning the dryer filter before each load increases the efficiency of the machine and decreases the chance of fire. 5. Clean out the dryer vent hose, as well as the rest of the vent duct. • Important Tip - Never overload the dryer.